This program provides currently certified teachers or aspiring teachers the opportunity to take individual NJCTL Online Courses for graduate credit as a non-matriculated students. These courses provide all the required instruction in both mathematics content and teaching methods to prepare an individual to teach mathematics and pass the state teacher assessment (i.e. praxis) in matheamtics. These courses also teach you how to properly implement the Progressive Mathematics Initiative (PMI) curriculum. For more details see: learning about the PSI and PMI curriculum. These graduate level classes may be taken with NJCTL for professional development credit hours only or through our partnership with Colorado State University - Global Campus, participants can have these courses placed on a CSU-Gloabl graduate transcript (restrictions and fees apply). Additionally, individuals who complete the NJCTL NJ Mathematics online courses are eligible to go on to complete a Master of Science in Teaching and Learning with Subject Matter Specialization in Mathematics degree with CSU-Global. Click here to learn more about the NJCTL/CSU-Global MSTL with High School Mathematics Specialization. 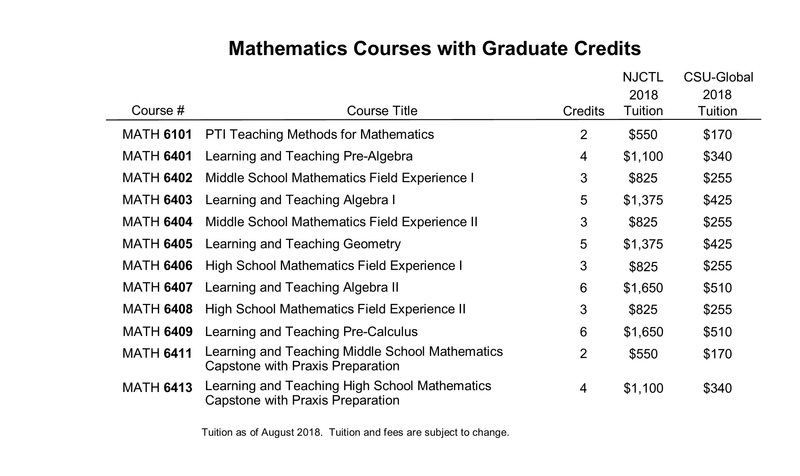 Click here to view the program of study with costs for the NJCTL/CSU-Global MSTL with High School Mathematics Specialization. Click here to learn more about the NJCTL/CSU-Global MSTL with Middle School Mathematics Specialization.